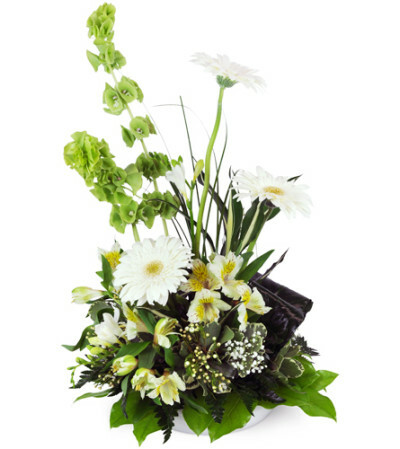 Tasteful and fresh as an Irish field, this unique and thoughtful arrangement says "I care" when mere words are not enough. 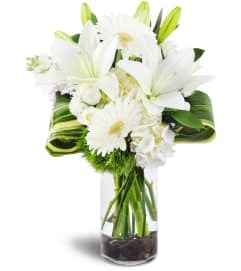 Striking bells of Ireland, white alstroemeria, freesias, and varied sprays of tiny white blossoms convey your sympathies with grace and elegance. Touches of yellow for sweet remembrance and a heartwarming scent make this gift the perfect way to say "I'm sorry for your loss." 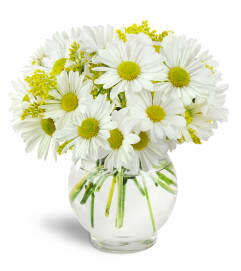 White Gerbera daisies, alstroemeria, freesia, and more are arranged in a deluxe white dish with lush greenery.